Hi! I'm Janice and I blog at http://www.socalsewingmom.blogspot.com/. 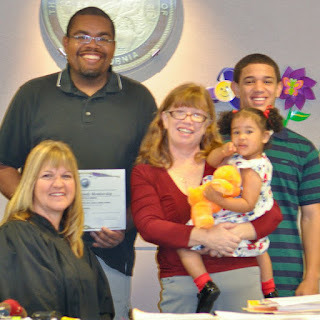 I'm here to share with you our journey through the foster care system of Los Angeles County - resulting in a very happy ending for our family. This is our story, and while the foster care systems across the country function differently, I'm sure that there are a lot of similarities with stories from across the country. My husband and I both felt very strongly that we wanted to do something to help the youth who were in foster care. We watched so many TV shows about people in prison, and heard horror stories about these prisoner's life in foster care. It was way too common a thread - kids bounce from one foster home to another, never really have a family connection, end up with the wrong crowd, and then finally in prison. We were at a point where my children were older, and we both felt that we could make a difference in the life of one child. It began with my phone call to the county office, where we were introduced to the process. We knew from the get-go that we wanted to fost/adopt. That meant that you become a foster parent first, which enabled the county to place a child in your home, then if the child became legally freed for adoption, you would be able to adopt that child. In the foster care system, the main goal for the social workers is "reunification". They want, if at all possible, to reunify the family. They want the children to remain with their parents. They will give the parents counseling, or whatever help they need to get their lives together to enable them to keep their children. If that is not possible, or the parents have proven incapable of taking care of their children, then they will attempt to place the children with a family member. If a family member is not available, then they rely on foster parents. We attended 13 weeks of training, two nights a week. The class had about 24 people. The people included married couples, single parents, gay, straight, black, white, Hispanic. Some people already had raised their own children. Some wanted to do foster care as a business. Some had infertility issues. Mostly, people were their for their own reasons. There was a background check. There was a home inspection. Once it was all completed, we became an official licensed foster care facility. I put all the gory details of our journey on my personal blog at http://socalsewingmom.blogspot.com/p/our-fostadopt-story.html. 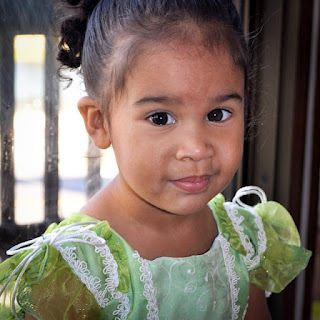 The bottom line of it all is that after about 18 months, we were the legal parents of a wonderful girl. We're lucky, and she's lucky. Maybe, some of you reading this might think you can become a foster parent. Think about it. You can provide a home, and love, for an older child. Or a sibling set. Or help any way you can. Please consider becoming a foster parent. If you have any questions that I can answer, please feel free to contact me through my blog - http://socalsewingmom.blogspot.com/. I'd absolutely love to answer any questions and would be perfectly honest about the challenges along the way. I have to say, it's the best decision I've ever made. My daughter and son-in-law have been doing foster care for five years now. We have shared in the lives of a number of wonderful children as foster grandparents. Some have stayed a few months, and some a few years, and one is now adopted into our family forever. It has been a great experience. She's beautiful! My son and daughter-in-law did the same program as you here in Louisiana. They've had a little boy for over a year which they are going to get to adopt. The court has already terminated the mom's rights, and they're just waiting on a few details to start the paperwork. Sweet story and happy faces on all. Lovely story! :D I will definitely take a look at your store. Sounds like a wonderful organization!